oh sorry. I missed A32x_system.xml file. I fix the issue and post a fixed panel saturday or sunday. The red beacons are already working even w/o (!) the A32x_system.xml file. If this file will be included in the A320_CFM folder, then there might be a double function for the red beacons. The beacon lights are pulsing and this will be visible inside the VC too. This was not the case with the FORK version. Here all new lights were switchable and working w/o any neg. light effect inside the VC. EDIT: The culprit is the additional light in the aircraft.cfg in the [LIGHTS] section: The de-activation from "light.4=4,....." solved the pulsing light issue on my end. In panel that I post last week, VC light switch don't work because code about these switchs are in A32X_System.xml file. But lights switchs in the 2D panel works. So I am preparing a new panel pack file, but I have some issues with the FBW protection that is in the A32X_System.xml file. When I set aircraft with a high bank, SEC1 is disconnected : ok. But when I recovery a right bank (0) , SEC1 switch flashes. So for the moment, I disabled in the file the FBW protection and restored my old code in A320_FMS_Com.xml file. So I just added in my protection code a condition to work only in Direct Law. The light switches on the 2D panel work without A32x_System.xml because I didn't modify it. Is there any tick to get the VOR or ADF needles to work? I thought you just needed to use the switches under the range switch but this doesn't seem to work even though it shows the thin and fat arrows in the corner of the display. Also, I think it would be a good idea if you can get the ILS switch for force the aircraft into approach mode. Have you switched the navigation controller in the EFIS to VOR or NAV? All ok on my end using A320 panel 2.0a. EDIT: Now I could duplicate this issue with the FMC/flightplan activated. The needles work on ground, but not after take-off...they disappear. A Q for Francois. ILS capture mode to be activated with the APPR button in the FCU area (bottom right). I was trying to see them in FMC mode, I would then change to Nav for a Vor approach once I was certain where I was. I am sure it used to work but cant remember when it stopped working. When I said Approach mode, I meant the actual Airbus mode, say I have a diversion or need to return to the departing airport, there's no way to activate ILS, I think it would make sense for the ILS button to activate the approach mode (by that I mean the under 3000 feet AGL ready for landing mode) too at any point. Edit, the A330 beta works fine so it's just a problem on the A32X. FMC Airport Manager V 1.01 is ready for testing. - You want fo fly from an Airport with SID, but not available? - create ONE SID or all and EXPORT and ready to use. All members of "Project FMC simplified for Project Airbus" can download the program and create their own SID and STARS, Appr. etc. per airport. For a normal User, these are of course not official and only suitable for his/her own use. Above does not apply to "FreenavDBgroup Airport developers", they know exactly what to do and what to look for. All recognized FreenavDBgroup Airport developers have no Limit. Currently: 10 "Project FMC simplified for Project Airbus" users per month. This limit should suffice to check any questions and bugs. The manual for "FMC Airport Manager V 1.01" is in a beginning state. VC light switch fixed to work without bug with overhead 2D. some change on ND approach readings and add some initialization code required by Bjoern's new variables. A32x_system.xml file is not required now. Code has been dispatched in other gauges. - go in the "\SimObjects\Airplanes\PA A32x_Common\"
- you must replace the line "Sound38=precip/c2prec1.wav,100" by this line "Sound38=./Sound/precip/c2prec1.wav,100"
Now rain sound works fine. Several VC switches do not work on my end. They all automatically switch off again after trying to switch on. APU can't turning on, ADIRS can't turning on, and automatically switch off after pushing. Can't fly. BTW, this is my first post here. Congrats to whole FD-FMC team, pretty good job! Last edited by fdd_fr on 05 Nov 2017, 21:39, edited 1 time in total. I am only using the new A320_2.0b folders set and installed both folders 1:1 into the Simobjects/Airplanes folder. 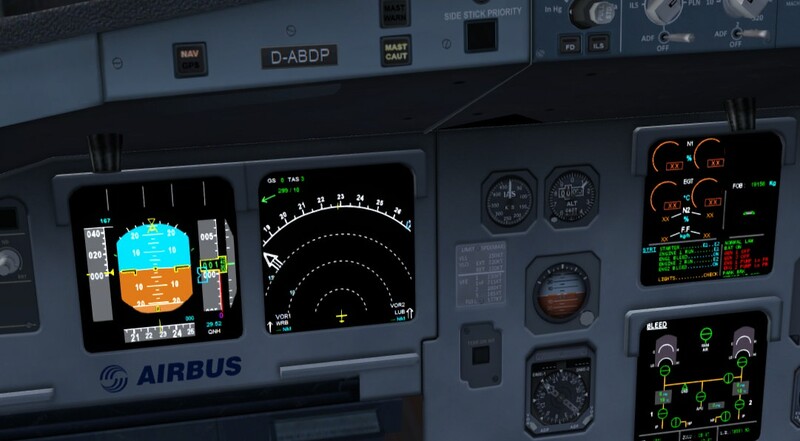 The old A320FD-FMC.cab is deactivated in the FSX/Gauges folder. Most switches are not working: ADIRS, APU, Cabin light and all external lights. The file A32x_System.xml exists in the A320_CFM folder, but is not activated in the panel.cfg folder. Intended? EDIT: The activation in the panel.cfg makes it worse. No soln. ok. I think that I found the issue. I have uploaded a wrong version. Thanks, but the download requires a password. EDIT: No password more nec. ok.
Now the switches work as expected (similar to the 1.60 configuration). Thanks! The "sound.CFM" folder is missing. Just copy the previous sound.CFM sound folder into the latest aircraft PA A320FD-FMC_CFM_2.0 folder again. The VC light in the cockpit is pulsing during night if the landing lights or the Nav logo lights are switched on. My workaround is to deactivate the additional cockpit lights "light.4=4,....." in the aircraft.cfg [LIGHTS] section although this new dimmed lights.4 are well illuminating the OHPanel during night. I hope there is a better idea to solve this pulsing light issue. Anyone else with the same prob? I found temporary solution: when situation as above occurs, just turning the panel light off and on again will help it's really working on my installation. Yes, but then no other light relating switch to be toggled. Otherwise the panel light off and on procedure begins again...a temporary solution. Here's a fork of v2.0B. Read the readme, especially the chapter dealing with carrying over repaints! You'll need to modify some lines of the [fltsim.x] entries (see the template at the top of every aircraft.cfg) and use new texture.cfg files (from "PA A32x_Common\texture.VC_Orange" or "PA A32x_Common\texture.VC_White"). This is the folder structure I prefer for the project since it completely separates the aircraft from the cockpit and all panel elements and drastically cuts down on duplication (minus 50 MB download size, minus 75 MB installed size compared to the v1.60 fork). The only difference between the IAE and CFM models is the ECAMS gauge anyway. I also reverted lighting system control to A32x_Systems.xml since I want to keep my contributions as separate as possible from François' to facilitate updating for me (and maybe him). Testing was only done on the ground so far and I'll try to squeeze in a flight tomorrow to see if there's any ill effects or bugs. I have an issue. Sometimes, during a flight, I loose all clickspot area in the VC. Can you tell me if someone has a same issue ? This may happen during dawn or dusk when the panel lights are off or when the eyepoint is too close to the headrest so that the camera is behind the closest polygon. thanks ! I change eyepoint and it seems now ok.
Q to Bjoern, is it posible to locate the VC model location x,y,z coordinates in a simple but seperate data file, so that all 4 Airbus A318/319/321 VC positions within each aircraft can be defined easily in each aircraft folder. I think the correct VC location within the aircraft is essential to avoid significant misplacement when you are looking out of the VC e.g. definition similar to coordinate definitions in the intelliscene.cfg. After the reorganization, I'm doing a bit of minor cosmetical work on the model. One of the things I'm fixing is the display brightness, which was reportedly too low during the day. After outsourcing the displays to a material with slightly different properties, they present themselves like this during the day. Hope that's better. No, not possible at all. The only way to alter the physical location without the source file is moving the model with ModelConverterX, at the risk of losing clickspots or other bugs. I can check how moving the entire cockpit in 3ds Max fits into my workflow and at least deliver .mdl files for the entire A320 family with every release, but I can't really hunt for bugs in FS each and every time since I only want to focus on the A320. Bjoern, can you tell me how you change the display brightness please? Is it via xml or is it hard coded into the model? Gauge brightness in P3Dv4 is a real problem and can often lead to unreadable displays, especially in the Ruth aircraft which seem almost like CRTs with a searchlight powering them. If you can edit a cockpit, maybe a wall behind the cockpit could stop this happening? Come on, the display brightness selectors aren't that hard to find. If you move backward, mouse clickspot stop working. 1. Immediate CTD because of missing A320_FlapLever_mod.wav sound file in the "PA A32x_Common/Sounds" folder. a) Simply delete in the "A32x_Sounds.ini" file the line "Sound40=A320_flaplever_mod.wav" and "Lvar40=A32x_FlapLever_Sound". I consider that a previous sound.CFM data set will be pasted as usual into the aircraft folder. All necessary sound files are included in this sound.CFM folder. (to be found in the sound.CFM folder) and rename it to "Sound40=A320_flaplever_mod.wav". or c) May be Bjoern provides the next time this magic wav.file. but not as usual with the joystick controller. Both throttles work fine with the joystick. I crosschecked again with the previous A320 CFM version, where everything works fine. They do nothing to solve the problem, the landing lights shining into the cockpit mean everything is mega bright, add in HDR and its unreadable no matter what settings are used. You won't see it unless you have P3Dv4. Re the above post, not being able to use a joystick axis for flaps is a pretty big issue. Known bug and yes, the file will be included in the next upload. The flap system is custom to prepare implementation of the automatic extension and retraction sequence for the 1/1+F configuration. Only the standard events like "flaps_up", "flaps_down", "flaps_decr" and "flaps_incr" are implemented via XMLEvents, which covers the default F5 to F8 keys and any controller buttons. Not sure how masking axis is supposed to work, to be honest. No P3Dv4 here. Have you tried the model without HDR? I can try to exclude all VC materials from being rendered with light bloom, but this won't solve any simulator limitations regarding other light sources like landing lights. - I have some issues with the FBW protection : SEC1 turn off at each input on my stick : is it normal ? - When bank is >30°, aircraft stop : ok, but if you release and push again, you can overide the 30° easily. I propose to set your protection with FBW full active and let my old protection when Direct Law is used. You have removed all the init code to get a cold and dark state when start up the flight. May be have you a reason ? You have removed the auto reset when a new flight plan is loaded. As some users load their flight plan after loaded the aircraft, without auto reset function, they will be a big issue when they landing (wrong airport altitude in the FMC data...). I don't understand why you removed this function. I agree that this new organization avoid many duplicate files and I am ok to keep it. So, I am afraid that some users will be lost or will have difficulties to install aircraft or to do updates, because elements are not in classic place. So for me, I am ok but I think that it will be interesting to get advices of this topic followers. I haven't yet the time to test other new functions (Traffic gauge). I will do it in during the week. But the most important AMHO is a better communication between us and dispatch work for a better efficiancy. Well, just tell me what you're working on and I'll try to find a way around. Generally, I'd like to focus on the aircraft systems. Yes. The switch on the overhead will have to be masked in future versions. Control device input runs at frame rate, the gauge running the FBW fix runs at 18 Hz, so it's possible to override the bank protection. Not much I can do about it. Ideally, there'd be a better solution for the FBW. All that's actually needed is a way to decrease the required controller input. I've also toyed with the idea of writing a PID controller for the pitch and roll axis and disable the default FBW logic altogether. But the refresh rate limit of 2D gauges would not make this a smooth solution. I don't like to have to reset everything every time I load the aircraft. Hence XMLConfig (or, in the next version, a Logger script, coordinated with your FMS load/save script to avoid interference). As written some time ago, I want to integrate an aircraft manager panel at one point, with buttons for loading, saving and resetting the plane to cold and dark. Because it reset the aircraft right upon touchdown during a flight for me. So it had to go. Normally, loading a new flight plan in FSX' flight planner and setting up the FMS should not interfere with the other aircraft systems in any way. After all, real crews don't shut down the entire aircraft during short turnarounds at the destination either, but just plug a new flight plan into the FMS while retaining APU/GPU power and other things. It will make things even easier when installing other models like the A319, 321 or 318 alongside since you won't need a gauge package for each and every aircraft. Distribution can be on a pack+add-on basis, with the "common" folder being the base pack and at least one aircraft being the minimum requirement to use the aircraft. According to DougDawson at FSDev, there'll be a 64bit traffic radar gauge soon, so P3D users can also use the TCAS. This is the reason why if you do a second flight, or if you load a new flight plan after launch the flight, there will be issues with FMC data. Last edited by fdd_fr on 12 Nov 2017, 16:09, edited 1 time in total. As stated above the axis controlled flap control worked fine in all previous versions. Now it doesn´t. There is an axis entry in the Joystick controller/Standard.XML which might be missing to be assigned? As I've said, the flap system is custom and therefor, axis control is currently not possible. I hope this can be solved soon, otherwise a development step backwards. Is this solveable by Francois´panel definition? Bjoern, here's what I was referring too, I appreciate it's hard to know what's going on when you don't have the sim. The grey speedtape, VSI etc is impossible to read with landing lights on. Is there a brightness switch on the normal FMC cockpit apart from the Int Lt on the overhead panel? François, that is the A330 beta and there's a weird double ghosting effect on the lettering at night with the A32x cockpit. No guarantees. It's basically a realism vs compatibility issue. Take your pick. Good idea, at least until I can outsource aircraft state management to a configuration panel. Or what about a "reset FMC" button in the FMC window? Do the A318, A19 and A320 require different values for some variables in the FMC compared to the A320 (e.g. for VNAV calculation)? If yes, what about an auto-detection algorithm that will determine the current type of A32x and assign the appropriate values to the e.g. VNAV related variables? This can be implemented pretty easily by reading the empty weight of the aircraft from the aircraft.cfg ((A:EMPTY WEIGHT,pounds)). So for a range of 90000 to 95000 lbs, the FMC knows that the current aircraft is an A320, while for anything more than 95000 lbs, it's an A321, for a range of 88000 to 90000 lbs, it's an A319 and with less than 90000 lbs an A318. This would eliminate the need to have three different FMC gauge files for each A32x model and make development and updating easier. I'm using this algorithm to auto-configure the payload manager for another aircraft and it works really well. In other news, I managed to improve my FBW fix a bit by cutting down the stick/yoke movement delay to the bare minimum. Letting go of the stick will now make the default FBW logic capture the target pitch and bank better. I'll take a look at your direct law code and see what I can do with it. Still unreadable, even some payware suffer from it. Its turned down to about 15-20% on that screenshot. Its because v4 has dynamic light which lights up everything, other planes landing lights even light up your cockpit. Spent the last few hours fighting with the bloody FBW system and bank and pitch protections. Elaborate attempts at a solution didn't yield a usable result, so in the end, XMLTools will simply block any attempts to bank or pitch the aircraft beyond (user definable) limits. No aileron axis control, no joystick axis blocking, no K: var spam for the elevators or ailerons. You will get some ugly minor shuddering when hitting a limit, but that's due to the 18 Hz refresh limit of 2D gauges and I can't do anything about it. Made provision to disable the blocking once the stick is moved in the opposite direction. Time to do more relevant stuff. Just googled the landing light issue and it's model related. Angling the attachpoint of the light source downward is supposed to fix this, but you'll at least need ModelConverterX to do this and do it yourself. Decide if the dynamic lights are really worth the trouble. I can't help you here. Thanks in advance. It is always good, if the sim user can choose his favourite control tool between mouse, keyboard or joystick. Below a pic, how I "managed" flap settings on my desk with all FDD panel and older fork versions.